This is the dating site which takes you straight to the person behind the profile. Chemistry.com is fully focused on matchmaking, rather than dating. And it is packed full of great features to help you find a deep, fulfilling relationship. The personality test is the stand out tool, placing you in one of four broad categories to help determine compatibility. Once someone does catch your eye, the “1-2-3 Meet” process allows you to get to know each other before being in contact directly. 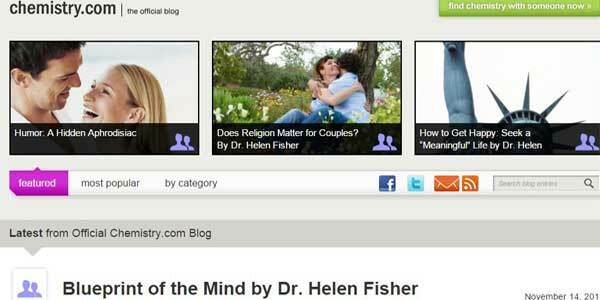 The scientific matching formula, developed by scientist Dr. Helen Fisher is at the heart of what Chemistry.com does. All you need to do is take the personality test and you will be categorized as a “Director,” “Negotiator,” “Builder” or “Explorer.” This will help you better identify other users who may be a good match. There is then plenty of opportunity to contact and get to know them. In addition to sending a private message, you can also “wink” other users to show your interest. Meanwhile, the “Stream” shows the activity of potential matches, which is another good way to assess your options. The “1-2-3 Meet” feature allows you to ask another user short questions to get to know each other before you have direct contact. The “Fortune Cookie” and “5 Card Set” are innovative ways to further investigate your potential compatibility. And if you want any further help, it is worth consulting the blog, which covers relationship issues and dating talking points. 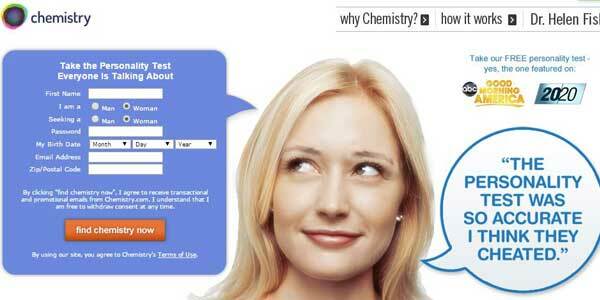 Signing up to the chemistry dating site takes longer, but it is well worth the wait. It takes around 30 minutes to complete the entire process. However, your answers to these in-depth questions form the basis of the matchmaking process, so it is wise to invest time in answering them accurately. The questions are divided into four sections, “My Personality,” “About Me,” “My Match” and “In My Own Words.” They cover all sorts of interests, views and personality traits, even your doodling style. All of which gives you a great opportunity to really represent who you are and focus what you are looking for in a partner. Chemistry collects plenty of data on you and your preferences. However, you should have no security worries as the site is also very effective at ensuring user safety. For a start, all financial transactions are encrypted. Meanwhile, all user profiles are screened by site staff. You also have the option to hide your profile and browse anonymously. 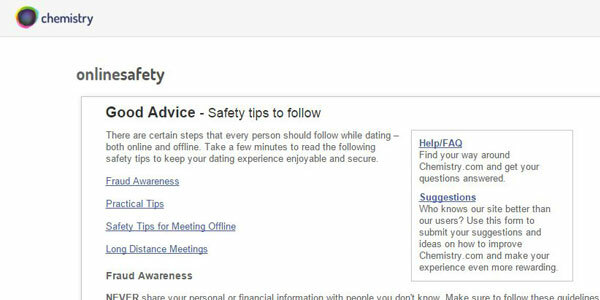 And of course, there is a page of excellent dating safety tips which is well worth reviewing. Free users can actually enjoy somewhat greater functionality than at other dating sites. You can take a short personality test and receive five matches without paying a cent. But if you wish to initiate contact with other users, you will need to pay. There is a free 3-day trial with use of all features. If you wish to extend this to a single month, it will cost you $39.99, while a 3-month package will cost $26.99 per month. Meanwhile, a 6-month deal is just $20.99 monthly. In addition, you can also pay extra for a “Member Spotlight,” which will see your profile featured for a 2-week period. The site is both easy on the eye and the brain. There is nothing complicated about using Chemistry and so you can relax and enjoy this well-designed site. Directly from the personal dashboard, you can access automated matches, the “wink” tool, your inbox and the all-important “stream,” which makes it very simple to keep in touch with what your potential matches are doing. If you like the format, but are looking for something a little less serious than a long-lasting relationship, then check out the excellent Match.com which has a very similar layout. Meanwhile, if you are a busy and often on the go, then the mobile app will let you keep up to date with all the action. There is a basic match tool, but the emphasis is very much on automatic suggestions, generated by the data and information you will have submitted on signing up. You can simply click on the “Matches” tab for a constant list of possibilities. Also, you will be sent five potential matches each day. All you need to do is assess them and then click “I’m Interested,” “Not Really” or “Decide Later.” Matching you with someone compatible requires very little input once you have signed up. Of course, you can always alter the answers you gave to the sign-up questions if you aren’t receiving the kind of matches you would like. This is the place to be if you are looking for love and want to find someone special, rather than a few fun dates. And with around 4,000 first dates being organized each week, Chemistry.com certainly gives you a great chance of doing just that. It strikes exactly the right balance between being simple to use and innovative features. These cutting edge tools aren’t just there for decoration, they really enhance your search. Chemistry.com comes highly recommended for serious daters.